Today I want to address something that's been weighing on my mind of late–how social media has changed, well, everything, and not all for the better. It's true that the emergence of social media has given businesses a way to connect to customers, and of promoting a dialog with them, but it has also placed an additional burden on already-stretched budgets and staff. Because social media exists, there is an expectation to use it, and that takes time and manpower. Someone has to sit and think of something to tweet several times a day, or to write the blog, and to address post commenters. While this has given rise to new jobs for young grads, is it really translating into increased sales? Or is it just straining resources even further? I believe this is why Facebook and google+ are popular—it doesn't take long to post a sentence or two or pass on a pertinent article, but it might take the better part of an hour to write a blog post. Certain industries are profiting more than others through social media– photographers and authors do well. But while it may be popular, posting on Facebook may increase exposure, but not always lead to more sales. What do you think? Has social media advanced or hampered your business? This may seem like a silly little tip, but I use it all the time. 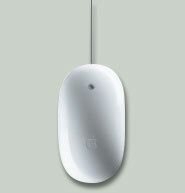 I have an Apple Mouse- the kind with a small scroll ball in the top of it. I find that sometimes it won't scroll in one direction or it's jumpy. I wish I could remember where I read this tip, so I could give the writer credit, but their answer was to turn it upside down and rub it on a piece of clean white paper. I know Apple wants you to use iKlear, but this works just as well and it's a lot faster!